If you wish to draw largely from the fountain of divine life, go to Mary; ask her to lead you to this fountain; she it is, indeed, more than any other creature, who will bring you near to Jesus. This is why we so justly name her: Mother of Divine Grace. Again that is why the Church applies to her this passage of the Scriptures: “He that shall find me, shall find life, and he shall have salvation from the Lord”. Salvation, the life of our souls, only comes from the Lord. 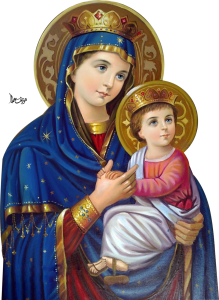 He alone is the one Mediator; but who more surely than Mary will lead us to Him, who have more power to render Him propitious to us then His Mother? We must imitate Jesus in all things; He, the Eternal Word, chose Mary for his mother; so we should choose her for our mother and have for her a child like devotion.